Everyday China, Everyday Silver and Fine Linen projects make up our popular Everyday Table Accessories collection. These projects provide a humorous way to describe your paper and plastic table accessories. Plans drawn FULL SIZE. 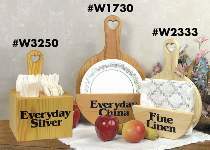 Order #1288 Everyday China Decal, #3084 Everyday Silver Decal or #8635 Fine Linen Decal separately or SAVE on the #3106 Everyday Table Accessory Special which includes all three plans and their decals. We also offer Special #2927 which includes Plan #W1730, Plan #W2333, #1288 Decal and #8635 Decal.